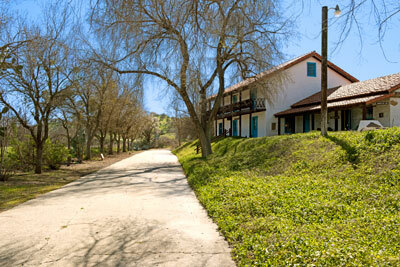 The Caledonia Adobe faces a short, surviving stretch of Old Stage Road. The Caledonia Adobe was built on El Camino Real as the private residence of Petronillo Ríos using Indian labor from the Mission San Miguel Arcángel. During its history the adobe has served as a private residence hotel, stage stop, saloon, school house, store and a dance hall during the Southern Pacific Railroad era. When the building was converted to a stage stop and hotel, it was named Caledonia by its current owner, W. B. Busherd, in honor of his native Scotland. The Caledonia hosted balls which the whole countryside attended. It was a famous hostelry in the stageline days and the scene of lively times when the Southern Pacific was building its railroad. It is said that the saloon and school occupied the adobe simultaneously, one on one side of the building and one on the other. It is also said that Tiburcio Vásquez, Joaquin Murietta, Jesse James and the Dalton Brothers visited the saloon. Source: Adapted from the NRHP nomination submitted in 1971. The Caledonia Adobe is also California Historical Landmark 936.